Red Apple Auctions’ team member Julie has been featured in this blog before for her ability to snag fabulous trips, experiences, and merchandise in sweepstakes competitions. 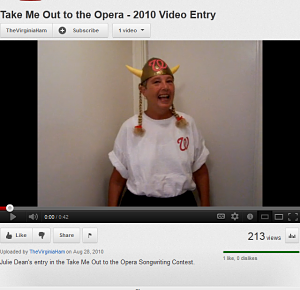 We’re going to throw a little more love her way as she’s putting her songwriting prowess on the line by competing in Placido Domingo’s “Opera in the Outfield” here in D.C. at Washington Nationals Baseball Park on September 19, 2010. Placido himself will select the first, second and third prize winners. The first place winner will have their song performed live by the crowd. Watch her video on You Tube and leave a nice comment, or give her some encouragement in-person. You can see her next working as part of the auction team on September 11, 2010 at the Headwaters Foundation gala. P.S. Julie worked in the White House for many years as a social aide. Could you host a charity auction in a shopping mall?